Read the Key Verse with your class. Ask your students if they like to go to church. According to our memory verse, attending church is important to God. That is how we know the way to live a life pleasing to God. Help them understand the word sanctuary: a sacred place dedicated to the things of God. The church today is a place where we gather to focus upon the things of God and to learn of the things of God. There is no one (or any thing) greater to place our focus and attention upon than God, our God. Summary Today we continue with the second of the Personal Books, Psalms. Remember that the Psalms is broken up into 5 books. We will look at book three of the Psalms (chapters 73-89) today, comparing them to the book of Leviticus. If you remember, the main theme of Leviticus was the tabernacle. That was the tent set up to hold the things of God and where man was to go to meet God. The first eleven Psalms of the third book of the Psalms were written by Asaph (he was one of the Levites David appointed to minister before the Ark of the Covenant with songs in I Chronicles 16:4-5.) We see him at one point as he struggled with jealousy over the prosperous wicked, until he went to the “sanctuary of God” – then he understood. Emphasis: We are to learn the importance of not desiring the things of this world, but placing our focus (our heart’s desires) upon the things of God. The one place we can go to achieve this purpose, is the church (the sanctuary – that place dedicated to the things of God). One idea for today’s lesson: (See picture below). 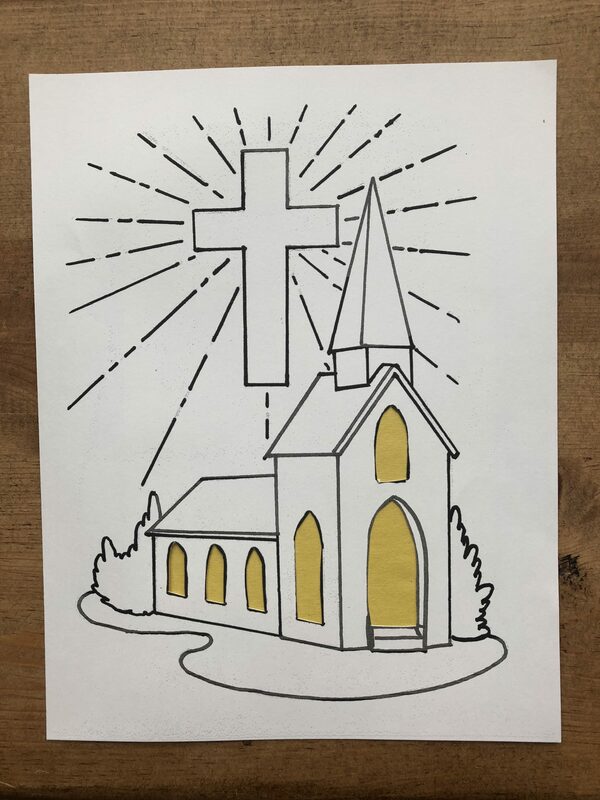 For today’s lesson I took a coloring of a church building. I cut out the windows and doors. The students were able to glue different colored pieces of small tissue paper to the back to make the windows look stained glass or just colorful. 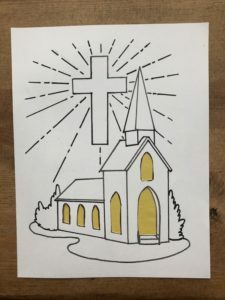 They then took time to color the church building. We are to encourage them to understand that the church building is a special place because it is the place God’s people go to meet together to place our attention on God and the things of God.